This is a list of radio telescopes - over one hundred - that are or have been used for radio astronomy. The list includes both single dishes and interferometric arrays. The list is sorted by region, then by name; unnamed telescopes are in reverse size order at the end of the lists. HartRAO 26m Hartebeesthoek Radio Astronomy Observatory, Johannesburg, South Africa 1.66–23 GHz 26 m dish. KAT-7 Carnarvon, South Africa 1200-1950 MHz Seven, 12 meter dishes. MeerKAT Carnarvon, South Africa 0.58-14.5 GHz A pathfinder for the Square Kilometre Array. Precision Array for Probing the Epoch of Reionization (PAPER) Carnarvon, South Africa 100-200 MHz Sixty-four crossed dipole antennas. Currently, this interferometer has more elements than any other. Degree Angular Scale Interferometer (DASI) Amundsen–Scott South Pole Station 26–36 GHz 13-element interferometer measuring anisotropies in the cosmic microwave background. South Pole Telescope (SPT) Amundsen–Scott South Pole Station 95–350 GHz 10-m microwave telescope making observations of clusters using the Sunyaev-Zeldovich effect. Delingha 13.7 m Delingha, Qinghai, China 85–115 GHz Dish diameter: 13.7 m. Site altitude: 3200 m. Operated by Purple Mountain Observatory. Nanshan 25m Ürümqi, China 1.4–18 GHz L/C/S/X band receivers. 70 km south to Ürümqi. Operated by XAO (Xinjiang Astronomical Observatory). Primeval Structure Telescope (PaST) Xinjiang, China 50-200 MHz PaST is planned to be an array of some ten-thousand log-periodic antennas spread over several square kilometers. Construction started in 2004. Miyun Synthesis Radio Telescope (MSRT) Miyun, China 232 MHz Array of 28 9-meter dishes. Miyun 50m Radio Telescope Miyun, China 2–12 GHz Built in 2005. Kunming 40m Radio Telescope Kunming, China 2–12 GHz Built in 2006. Giant Metrewave Radio Telescope (GMRT) Pune, India 50-1420 MHz Thirty 45 m wire dishes; largest telescope at meter wavelengths. Operated by the National Centre for Radio Astrophysics. Ooty Radio Telescope (ORT) Ooty, India 326.5 MHz approximately 530 m long and 30 m wide. Gauribidanur Radio Observatory, Gauribidanur, India 40-150 MHz Operated by (Indian Institute of Astrophysics). A Radioheliograph. Qitai Radio Telescope Qitai County, Xinjiang, China 300 MHz–117 GHz. Construction work started in 2012. Will be operated by XAO (Xinjiang Astronomical Observatory). (ASKAP) Murchison Radio-astronomy Observatory, Western Australia 700-1800 MHz ASKAP, the Australian Square Kilometre Array Pathfinder, is currently being built by CSIRO. It will be made up of 36 identical antennas, each 12 metres in diameter, with a 30 sq degrees FoV at 1.4 GHz. 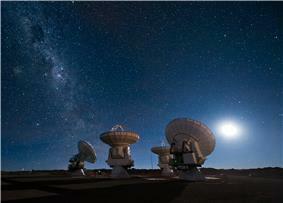 All 36 antennas and their technical systems are expected to be completed by 2013. (ATCA) Paul Wild Observatory, Narrabri, New South Wales 0.3–110 GHz 6x22m dish aperture synthesis array, operated by CSIRO as part of the ATNF (Australia Telescope National Facility). (CDSCC) Tidbinbilla, Australian Capital Territory 1x70m dish, 2x34m dishes, operated by CSIRO on behalf of NASA. Molonglo Observatory Synthesis Telescope (MOST) Molonglo (near Canberra, ACT) 600-1200 MHz Operated by the School of Physics at the University of Sydney. East-west arm of the former Molonglo Cross Telescope, approximately 1.6 km in length. Operates at 843 MHz. Mopra Radio Telescope Mopra Observatory, near Coonabarabran, New South Wales 0.3 – 100 GHz 22 m dish, operated by CSIRO as part of the ATNF (Australia Telescope National Facility). Parkes Radio Telescope Parkes Observatory, New South Wales 64 m telescope (2nd largest movable dish in the Southern Hemisphere), operated by CSIRO as part of the ATNF (Australia Telescope National Facility). Ukrainian T-shaped Radio telescope, second modification (UTR-2) Grakovo, Kharkiv, Ukraine 8–40 MHz World's largest radio telescope at decametre wavelengths (max. collective area 150 000 m²). RT-22 Pushchino, Russia Four 22 m fully steerable radio telescopes. At the 1960s the centimeter and millimeter-wavelength RT-22s had a world record-breaking high angular resolution for individual radio telescopes. Operated by the Pushchino Radio Astronomy Observatory. 32 m VLBI dish Noto Radio Observatory, Noto, Italy,  0.3–86 GHz 32 m, fully steerable dish, 300 MHz-86 GHz. Operates both as part of astronomical and geodetic VLBI network and as a single dish. MERLIN (Multi-Element Radio Linked Interferometer Network) United Kingdom Consists of the Cambridge 32 m at Mullard Radio Astronomy Observatory, Darnhall, Defford, Tabley (also known as Pickmere) and Knockin. Also includes the Lovell and Mark II telescopes at Jodrell Bank. IRAM - 30m Pico Veleta, in Granada, Spain 30m dish operated by the Institute for Millimetric Radio Astronomy (Institut de radioastronomie millimétrique, IRAM); works in the millimeter range (1mm to 3mm) both with superheterodyne and bolometric detectors. Toruń RT3 15 m Toruń Centre for Astronomy, Toruń, Poland RT3 (15 m) antenna. 22 m telescope Simeiz Observatory, Simeiz, Crimea, Ukraine 22-m radio telescope for mm and cm radio waves. Located at the foot of mount Koshka (Cat) in Katsiveli (near Simeiz). Belongs to the Crimean Astrophysical Observatory, the Department of Radioastronomy. Pluton (complex) Center for deep space communications, Evpatoria, Crimea, Ukraine 8 mirrors with diameter of 16 meters. Square is 1000 sq. meters. Metsähovi Radio Observatory Kylmälä, Kirkkonummi, Finland 2–150 GHz 13.7 m dish, operates at 2 to 150 GHz, surface accuracy 0.1 mm (rms). Ryle Telescope Mullard Radio Astronomy Observatory, Cambridge, England Eight 13 m dishes, and is currently used as one part of the Arcminute Microkelvin Imager. Plateau de Bure Interferometer Plateau de Bure, Grenoble, France Originally an array of 3 antennas, since 2005 has 6 antennas, operating at millimeter wavelengths. Northern Extended Millimeter Array France 12 antennas, operating at millimeter wavelengths (Operational: 2019). ALLBIN (Amateur Linked Long Baseline Interferometer Network) Germany A Small Network of Radio Telescopes and Radio Spectrographs doing Amateur Radio Astronomy at a Very High standard coordinated by The European Radio Astronomy Club Research and Development Telescope in Mannheim Germany. ROT-54/2.6 Mount Aragats, Armenia, near Yerevan 1.5–300 GHz Radio optical Telescope with 54 m Spherical Reflector Antenna and 2.6 m optical telescope on the same axis. One of the most sensitive and low noise antennas in the world. Algonquin Radio Telescope Algonquin Radio Observatory, Algonquin Park, Ontario, Canada 46 metre fully steerable dish operated by Thoth Technology, Canada's largest radio telescope. ARO 12m Radio Telescope Kitt Peak National Observatory, Tucson, Arizona, USA Previously operated by the NRAO, this telescope is currently operated by the University of Arizona's Arizona Radio Observatory, part of Steward Observatory. The Canadian Hydrogen Intensity Mapping Experiment (CHIME) Dominion Radio Astrophysical Observatory, Okanagan Falls, British Columbia, Canada 400 - 800 MHz A novel drift scan telescope, which will consist of five 100 x 20 meter cylinders, with an array of radio receivers along the focus. Will map the 21 cm line of neutral hydrogen over the cosmological redshift range of 0.8 to 2.5. Currently operating a pathfinder telescope with two half-length (40 x 20 meter) cylinders. Combined Array for Research in Millimeter-wave Astronomy (CARMA) Owens Valley Radio Observatory, Big Pine, California, USA 75–345 GHz Heterogeneous interferometer array composed of 6 10-m elements, 9 6-m elements, and 8 3.5-m elements covering frequencies ranging from 27–36 GHz, 80–115 GHz, and 215–265 GHz. Operated by joint agreements between Radio Astronomy Laboratory University of California, Berkeley, Caltech, University of Maryland, College Park, University of Illinois, Urbana-Champaign, and the University of Chicago. Dominion Radio Astrophysical Observatory Okanagan Falls, British Columbia, Canada 408 - 1420 MHz Synthesis telescope consists of seven 9-metre (30 ft) parabolic antennas, three of which are movable along a 600-metre rail line. Heinrich Hertz Submillimeter Telescope (SMT) Mount Graham, Arizona, USA 10-meter radio telescope operated by the University of Arizona's Arizona Radio Observatory, part of Steward Observatory. Large Millimeter Telescope (LMT) Sierra Negra, Puebla, Mexico A 50-meter telescope for observations at millimetre wavelengths, the largest single dish instrument operating in this wavelength band. Morehead State University 21m. Morehead, Kentucky, USA A 21 m. telescope used for academic research and satellite data retrieval and control. OVRO 40 meter Telescope Owens Valley Radio Observatory, Big Pine, California, USA 15 GHz This cm wavelength telescope operated by Caltech, is currently being used on a blazar monitoring program at 15 GHz. Peach Mountain Observatory Ann Arbor, Michigan, USA 26m telescope built in 1958, operated by the University of Michigan. Currently undergoing renovation. Solar monitor, two 1.8 m dishes Dominion Radio Astrophysical Observatory, Penticton, British Columbia, Canada The first dish here was originally a backup for the Algonquin site, but when the ARO site was later closed its instrument moved to DRAO and became its backup. SRI International Antenna Facility Palo Alto, California, USA 45.7 m parabolic reflector. Owned by the U.S. Government and constructed by SRI on land leased from Stanford University, the Antenna Facility is known locally as "The Dish." Very Large Array (VLA) Socorro, New Mexico, USA Array of 27 dishes. Part of NRAO. Very Small Array (VSA) Cogan Station, Pennsylvania, USA Array of 8 small dishes. Part of The SETI League's Project Argus initiative. (operations center) Array system of 10 radio telescopes; dishes are located at Mauna Kea, Hawaii, Owens Valley, California, Brewster, Washington, Kitt Peak, Arizona, Pie Town, New Mexico, Los Alamos, New Mexico, Fort Davis, Texas, North Liberty, Iowa, Hancock, New Hampshire, and St. Croix, U.S. Virgin Islands. Atacama B-Mode Search (ABS) Llano de Chajnantor Observatory, Atacama Desert, Chile 127–163 GHz 60 cm telescope located on Cerro Toco and designed to measure the polarization of the CMB. Atacama Cosmology Telescope (ACT) Llano de Chajnantor Observatory, Atacama Desert, Chile 6 m telescope located on Cerro Toco. Atacama Large Millimeter Array (ALMA) Llano de Chajnantor Observatory, Atacama Desert, Chile 54 dishes with 12-m diameter and 12 dishes with 7-m diameter, sensitive to wavelengths between radio and infrared (submillimetre astronomy). Atacama Pathfinder Experiment (APEX) Llano de Chajnantor Observatory, Atacama Desert, Chile 12 m telescope located at the Chajnantor plateau. Atacama Submillimeter Telescope Experiment (ASTE) Llano de Chajnantor Observatory, Atacama Desert, Chile 10 m telescope located at Pampa La Bola. Cosmic Background Imager (CBI) Llano de Chajnantor Observatory, Atacama Desert, Chile 13 dishes with 1m diameter located at the Chajnantor plateau. Decommissioned in 2008. NANTEN2 Observatory (NANTEN2) Llano de Chajnantor Observatory, Atacama Desert, Chile 4m telescope located at Pampa La Bola. POlarization Emission of Millimeter Activity at the Sun Complejo Astronomico El Leoncito (CASLEO), San Juan Province, Argentina 45 and 90 GHz Full sun disk patrols with left- and righ-hand circular polarization receivers. Q/U Imaging Experiment (QUIET) Llano de Chajnantor Observatory, Atacama Desert, Chile Located at the Chajnantor plateau. Solar Submillimeter Telescope (SST) Complejo Astronomico El Leoncito (CASLEO), San Juan Province, Argentina 212 GHz and 405 GHz 1.5 m radome enclosed, single dish Cassegrain antenna, with a focal array (4 beams @ 212 GHz, 2 beams @ 405 GHz) of room temperature receivers. Very Small Array (VSA) Observatorio del Teide, Canary Islands, Spain Array of 14 dishes, with two larger source-subtraction dishes. Controlled remotely from UK. Arecibo Observatory Arecibo, Puerto Rico 305 m (1,001 ft), The world's largest single-dish radio telescope. Submillimeter Array (SMA) Mauna Kea Observatory, Hawaii, USA Operated jointly by the Smithsonian Astrophysical Observatory and the Academia Sinica Institute of Astronomy and Astrophysics of Taiwan. HALCA (Highly Advanced Laboratory for Communications and Astronomy) Earth orbit with an apogee altitude of 21,400 km and a perigee altitude of 560 km. Spektr-R or RadioAstron 10 meter radio telescope in a highly elliptical earth orbit. Launched July 2011. FAST (Five hundred meter Aperture Spherical Telescope) Guizhou, China 0.3-5.1 GHz Under construction. Once completed in 2016, FAST will be the world's largest and most sensitive radio telescope and three times more sensitive than the Arecibo Observatory. Operates at 300 MHz to 5.1 GHz. LOFAR Super Station (LSS) Nançay, France 10-80 MHz The Nancay radio astronomy observatory and associated laboratories are developing the concept of a "Super Station" for extending the LOFAR station now installed and operational in Nancay. The LOFAR Super Station (LSS) will increase the number of high sensitivity long baselines, provide short baselines and an alternate core, and be a large standalone instrument. It will operate in the low frequency band of LOFAR (30-80 MHz) and extend this range to lower frequencies. Square Kilometer Array (SKA) Australia, South Africa 0.05–30 GHz This array, if built, would be 50 times more sensitive and 10,000 times faster than any other radio telescope.